South Indian Festivals - South India is a land of festivals, with varied cultures and traditions. They follow Dravidian tradition and has different ways to celebrate their festivals. Most of the festivals of this culture rich land are based on mythology and seasonal change. During the festival time, the cities and villages of South India become vibrant and colorful. The religious places are adorned with startling lights and the people’s whole-hearted participation and involvement in the way they celebrate these festivals can be seen in amazement. The varieties include Religious Festivals, Temple Festivals, Music and Dance Festivals etc. Get a copy of South India Festivals E-book here. Onam, the most important and widely celebrated festival of Kerala State, is the harvest festival lasting for 10 days. Onam festival is celebrated in the Malayalam month of Chingam, which usually falls in the month of August/September. This grand south Indian festival is celebrated with joy and enthusiasm all over the State by people of all communities, irrespective of their religion and status. The main features of this festival are Pookkalam, Kaikkottikkali, Onasadhya, Snake Boat Race etc. Onam Festival. Pongal Festival is the main festival of Tamil Nadu. It is a festival of Thanks giving to the Sun, the Earth and the Cow. Pongal is one of such highly revered festivals celebrated in Tamil Nadu. This South Indian festival is celebrated with joyous festivities and rituals to mark the harvesting of crops by farmers, and it usually falls in the month of January every year. It is a four-day Harvest festival of South India and marks the end of winter and the beginning of spring. Mahashivaratri festival is a national festival and celebrated on the fourteenth night of the full moon during the dark half of the month of Phalguna. It falls on a moonless night of February-March, when Hindus offer special prayers toLord Shiva. Shivaratri is the night when he is said to have performed theTandava Nritya. The festival is observed for one day and one night only. The day is spent on fasting and chanting "Om Namah Shivaya" and the night is kept awake. Click here to get more information about Shivratri. Vinayaka Chaturthi is celebrated as the Birthday of Lord Ganesha, the elephant-headed son of Lord Shiva and Goddess Parvathi, which falls in August-September. This festival is also known as Vinayaka Chavithi and Ganesh Chaturthi. It is celebrated all over India, but more elaborately in Karnataka, Andhra Pradesh, Maharashtra, Gujarat and Goa. Learn more about this festival. Dusserah (Dasara) Festival is celebrated all over India, but in Karnataka it is celebrated as Mysore Dusserah in the honour of Goddess Chamundesseri who killed the great demon, Mahishasura. It is a 10-day festival. On the day of Dussehra, a procession of caparisoned elephants carrying the idol of goddess Chamundi is taken through the city. 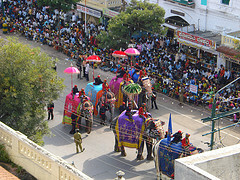 The city of Mysore is synonymous with its annual Dusshera procession. This south Indian festival is also called as Vijaya Dashami. Dasara/Vijayadashami. Deepavali is a festival of lights, celebrating the victory of light over darkness and good over evil. It is a national festival and celebrated all over the country in October/November. In South India, it is called as Deepavali and celebrated on the victory of Lord Krishna, the Hindu deity, killing the demon king and freed the people from suffering, whereas in North India it is called as Diwali. 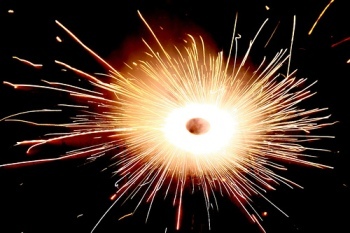 Deepavali Festival. Ugadi Festival - Ugadi is the beginning of a new Hindu lunar calendar with a change in the moon's orbit. It falls on "Chaitra Masa", the Spring month. This festival usually falls at the end of March or early April. Ugadi is the Festival of Karnatakaand also the Festival of Andhra Pradesh in South India, and it is celebrated with great enthusiasm. The main feature of this festival is Bevu Bella in Karnataka and Ugadi Pachadi in Andhra Pradesh. Ugadi Festival. Makara Sankranthi is the harvest festival of the people of Andhra Pradesh. It is celebrated for three days with all grandeur and usually falls in the middle of January. The first day is Bhogi, the second day is Sankranti and the third day is Kanuma. Makara Sankranthi Festival. Karthigai Deepam Festival is celebrated in the Tamil Month of Karthigai which falls in November/December. This is a nine days festival starting from Uthradam day, and considered as the oldest festival of Tamils. Karthigai deepam is celebrated lighting rows of agal vilakkus in front of every house. The lighted lamps are considered as auspicious symbol. It is believed to ward off evil forces and usher in prosperity and joy. Varamahalakshmi Puja - celebrated in Aadi month. Want to learn more about the various festivals celebrated in South India from this ebook. South India Festivals E-book.